Don’t worry your roof is not leaking anymore. That stain that you see on your ceiling, its mold. I thought it was important to make a video about something that occurs over and over and over again. As a roofing company we spend a lot of time looking at leaking roofs and one of the things that we get after we have repaired a leak on someone’s roof is a phone call and that phone call often is a question of when can you come back because we think the roof is still leaking. So on many occasions that we go out, we look at the roof, we see the stain on the ceiling and the ceiling stain has grown, but here’s the thing, the roof isn’t leaking anymore. What’s happened is the mold that’s on the roof has grown. So if you do have a leaking roof and you do have a stain on the ceiling, if you don’t clean that stain or you don’t treat that stain properly, it will continue to grow. So don’t worry, your roof is not leaking. You just got to clean the mold. In today’s video I just want to establish some clarification in relation to the safety of workers on your roof. Due to the fact that roofing is a job where we are often working at heights, we have to put a plan in place to make sure safety of our workers is considered. The three main things that you see when people are working on a roof is, one, scaffolding. Most people understand and know what scaffolding is, but it’s often confused with edge protection. Edge protection is simply a fence that goes around your roof so that should a worker fall they hit the fence. The third thing is harnessing. We can put harnessing in place where either scaffolding or edge protection is either too expensive or not necessary. As long as we can ensure that the safety of the workers, are not going to risk falling at heights, we have ensured the safety of the workers on your roof. In today’s video I’m going to explain why most roofers are not actually licensed to paint your roof. In roofing there are two different licenses for roof tiling and metal roofing and the roof tiling license has specific scope of works of what can be done when it comes to a tiled roof. In that roof tiling license it actually specifically states that a roof tilers are not allowed to paint tiled roofs. The reason there is confusion in this is because of the words thrown around roof restoration. Now, if you are looking to getting your roof painted you need an operator who has a painters and decorators license as well. If they don’t have that license they’re actually not licensed to paint your roof. In this video I’m going to explain how to find out what brand of tiles you’ve got on your roof. So, when it comes to roof repairs one of the things that we have to know is what type of tile you got on the roof. So if you’re looking to a get a quote or one tile was changed quickly best thing you can do is tell us what tile you have, that way we can bring tiles if you don’t have them. The way to do it is simply flip a tile over and have a look on the bottom of the tile what the name is. If you can’t get on the roof and flip the tile over, no worries, most houses usually keep spares somewhere, either under house, at the back, but just check that if you can’t find any spare tiles lying around anywhere then your last chance is to open the manhole, shine up the torch and see if you can see the underside of the tile. If none of those ways have worked or you’re not comfortable with any other ways, best thing to do is to get someone else to come and have a look for you. Roof Repairs on all types of roofs, roof replacements in Colorbond, timber work and all other roofing, yes we do it! There is almost nothing we won’t do when it comes to roofing. We also do a large variety of home improvements too. Call 1300 90 20 37 and we will be more that happy to discuss the work with you. We have offer all roofing services and have a for long time. There is no better way to find out what is going on with your roof than book a free quote, so don’t hesitate in having one of our trained consultants inspect and quote your roof for free! All quotes are detailed and clearly written. 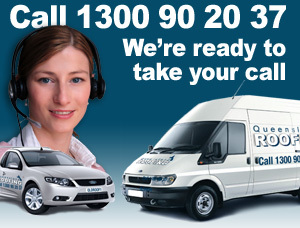 call Call 1300 90 20 37 now! OVER THE PHONE QUOTES AVAILABLE! Not ready to have someone out at your property. No worries. Technology has allowed us to use satellite imaging to provide very accurate quotes and estimates for your roofing project. So, in this video I’m going to talk quickly about repairing asbestos roofs. So, with constant law updates we’re in a situation where repairing asbestos roofs isn’t an easy thing to do. We are not allowed to cut asbestos, we are not allowed drilling through asbestos, we are not even allowed to pressure clean asbestos. There’s a whole series of things. So if we are not able to do these things performing repairs on it become quite tricky. So where does this leave you if you have a leaking asbestos roof? Well, on most occasions now we either can patch them with certain glues, silicons and waterproof membranes, keeping in mind we are still not allowed to prepare the roof with a lot of those prior processes I mentioned. So it can be done on some occasions but not all occasions.